The Scotty Cameron American Classic 3 Heavy Flange is an elegant updating of the classic bullseye flange shape, and really looks the part. As you can see from the picture it's rounded in all the right places and despite having a wider flange than the original bullseye flanges, it doesn't look clumsy or overly fat. That having been said aiming one of these babies is not easy! Especially if you compare it with more modern designs with long lines or two ball designs. Beyond the soft edges of the putter, you can't actually see the whole of the leading edge of the putter because of the off-set hosel which covers the heel. 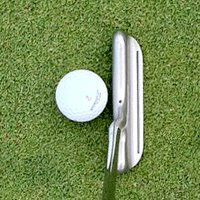 Much though I love the elegance of the shape, when you're got only half of a fairly curvy shape to aim with, it really doesn't give you much of an aid to aiming at all... and that in today's putter market is a distinct disadvantage. Having admired the soft shape, I expected a delicate feel when striking the ball, but instead I got only a hard click. It's obviously a matter of taste whether you like that, and on the positive side the hard click it is extremely direct - you know exactly whether you've struck it out of the sweetspot or not. The other thing to say about the sweetspot is that it seemed to me to be quite a bit bigger than the original bullseye flange putters (I putted with one of these for years, so know all about what missing the sweetspot feels like!). This is most definitely a positive. If you're wondering "just how heavy is the Scotty Cameron American Classic 3 Heavy Flange", I can tell you this - it's not that heavy. Especially as it comes with a 33 inch shaft as standard, you don't notice the weight being anything extraordinary. The roll is excellent - a real strength of this putter. You can really see the ball rolling end over end on almost every putt and as a result you'll see the ball diving into the cup from all angles. 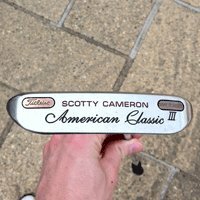 If you like the classic center-shafted bullseye putter shape, and you want an updated version then the Scotty Cameron American Classic 3 Heavy Flange is the best one we've seen. The feel is firm, but you'll probably get used to it. The roll is excellent. Because of the difficulty of hitting the sweetspot with a long seing, we wouldn't recommend this putter if your you normally play on greens that run slower than 9 or 10 on the stimpmeter (medium/fast for club greens). Scotty Cameron Bullseye Platinum Heavy Flange A Bullseye putter worthy of consideration! The offset neck and flange aren't quite what you'd want if you're a purist, but it putts better.